What’s the story behind the cement artichokes in downtown Menlo Park? When walking west from Menlo Park Presbyterian Church on Santa Cruz Avenue, you might wonder about a string of six giant artichokes sitting atop gate and fence posts at 1060 and 1064. These cement artichokes were made by Martin Dioli (1897-1956) using a mold created for him by an artistic friend. 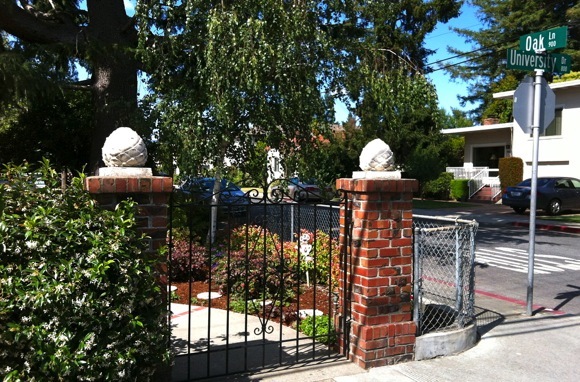 In fact, the original cement artichokes still adorn the gate to the Dioli house at 875 University Drive. The house was built by Martin in the early 1930s and is presently occupied by his daughter and her husband. A few of these artichoke species have reputedly spread south to the vicinity of Davenport. Note: This article is based on an article, Tribute to the Cement Artichoke, by Lydia Cooper, that appeared in the March-May 2007 edition of The Gate Post, newsletter of the Menlo Park Historical Association.